WARNING – This is not a healthy meal!! Are you one of those people who loves halloumi but doesnt really know what to do with it apart from grill it in slices? If so then this is the recipe for you! I am asked by the other half for this tea quite often, it’s one of his faves and as I have fed him healthy meals for the last 3 days I thought I’d give him a treat. You can make your own pesto or buy a jar, its up to you! I made my own because I had some basil that needed using up. The recipe below is based on what I just made which fed 2 of us a decent portion and a little left for lunch tomorrow so double up if you want to cook for 4. 75g frozen garden peas – defrosted in boiling water then drained. Pesto – if making fresh or use half a jar. Lightly toast the pine nuts in a dry frying pan by heating for a few minutes and reserve a third to top your pasta at the end. Heat a pan of salted water and cook the pasta until al dente. 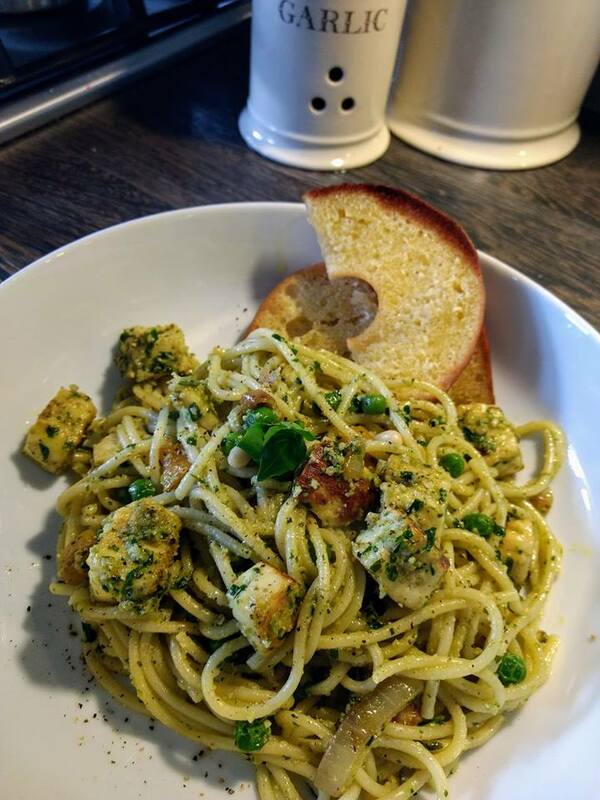 While the pasta is cooking make your pesto, if making fresh, by putting the basil , 50g of the pine nuts, parmesan, garlic and oil in a food processor and blitzing to make a paste. If it seems dry just add more oil. Lightly fry the onion and green peppers in a frying pan in a little oil until soft then add the halloumi and fry for a minute until it starts to go soft, add the peas and 2 tablespoons of pesto and cook gently making sure the garlic in your pesto is cooked, if it starts to stick add a splash of water. Add your cooked and drained pasta and mix well. If it appears dry just add some of the cooking water from the pasta to loosen it up. Season with salt and black pepper. Serve in a large bowl and then decorate with the reserved toasted pine nuts and a few sprigs of basil. To be extra greedy, serve with garlic bread!